A 4-week study with Rhodiola rosea suggested 200 mg twice daily (400 mg/day) was a safe dose.8 Some clinicians report that at clinically-studied dosages, certain individuals experience a paradoxical effect (i.e. opposite than the expected effect). What is often the case in these scenarios is that a healthcare professional may reduce the dose or discontinue the use of Rhodiola. However, an alternative theory exists. This theory suggests that those individuals experiencing paradoxical effects of Rhodiola at clinically-studied doses may benefit from slightly higher doses (within the accepted safe range) rather than lower doses. How could this be? Practice is an art and, as with any art, there are variances to each artist’s preferences based on what they observe in their media. Oftentimes, science influences preferences in the artist, but never does it fully replace the art. Most practitioners are familiar with dose dependency. Increasing the dose of any given supplement increases its effect. However, one herbal theory is that Rhodiola can be “stimulating” at low doses and have a “toning” effect at higher doses. These terms are loosely defined in herbalism. 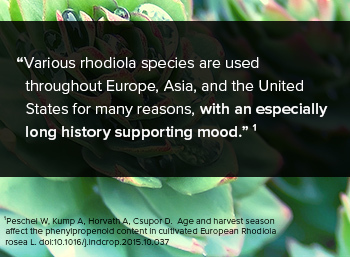 From a basic science opinion, this may mean affecting availability of neurologically important amines.7 Rhodiola may also affect catecholaminergic transmission, through GABA-ergic, serotoninergic, and noradrenergic receptors. * Finally, the herb, or active constituents may also have an effect on corticotrophin-releasing factor. *7 Given the complexity of the herb and its potential pleiotropic effects in the central nervous system, as well as the manner in which it is metabolized, it is no wonder that a diverse species such as homo sapiens may have a broad spectrum of experiences. Given this information, most practitioners begin with a known, studied dose in humans and titrate up or down to reach the desired effect. Seems like a lot can be learned from the practical use of this little herb. Hellum BH, Tosse A, Hoybakk K, Thomsen M, Rohloff J, Gerog Nilsen O. Potent in vitro inhibition of CYP3A4 and P-glycoprotein by Rhodiola rosea. Plant Med. 2010 mar;76(4):331-8. doi: 10.1055/s-0029-1186153. Edwards D, Heufelder A, Zimmermann A. Therapeutic effects and safety of Rhodiola rosea extract WS 1375 in subjects with life-stress symptoms – results of an open-label study. Phytother Res. 2012 Aug;26(8):1220-5. doi: 10.1002/ptr.3712.